Eating snacks right out of the bag can be dangerous and messy while driving. Now there's a product to keep your favorite snacks and beverages safely at arm's reach when you travel, or when you're at home, work, or at play. The Smart Snacker Products My Smart Snacker™ comes with a container with two built-in storage compartments designed to hold snacks and beverages. We also include a Snap-On Lid to keep snacks fresh when not being consumed. 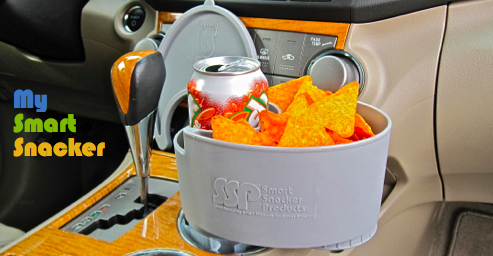 There's a removable Cup Holder Base so My Smart Snacker™ can be installed into existing cup holders. What's more, the Cup Holder Base can be used to store personal items as well. There's a Screw-On Cap for keeping your personal items secured in the Cup Holder Base (when the Base isn't in use). And finally we include a Flexible Sleeve that slips over the Cup Holder Base, which allows for a secure fit in standard or large stationary cup holders measuring up to 4" in diameter and at least 2" in depth. Smart Snacker Products LLC sells its patented My Smart Snacker™ at Wholesale Prices to Retail Stores. We think you'll find that our My Smart Snacker™ will be a profitable addition to your current product line. Smart Snacker Products LLC also sells to Schools (for Fund Raising Events). Our patented My Smart Snacker™ Personal Travel Container will be a unique and profitable product for your annual, or semi-annual Fundraisers. Smart Snacker Products LLC will be happy to send you a formal wholesale quote for your consideration. Feel free to contact us by phone or via email with your request.